My oldest daughter has been interested in learning French since she was four years old. I’ve bought her audio books recorded in French so that she could be immersed in the language and several French dictionaries and other books to help her learn the language. Recently she began the Elementary French I (Grades 3-5) course from Middlebury Interactive Languages . The course is entirely online and must be accessed from a computer. We received six month access to the Elementary French I course. 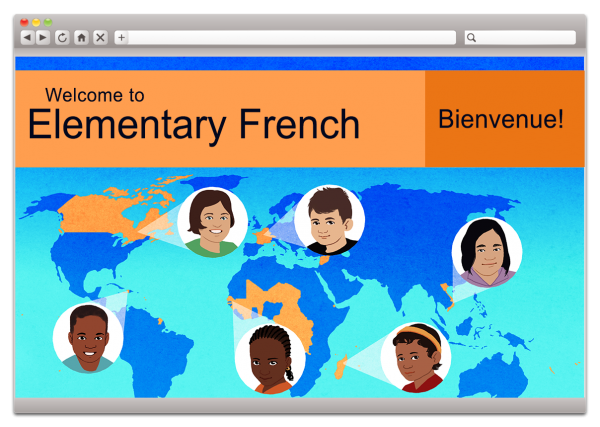 The Elementary French I course consists of 16 units which focuses on beginning common French words used for greetings, food, clothes, weather, etc. There are two review units within the 16 units, one midway through the program and the other at the end. The program is automatically scheduled. My daughters schedule began on the first day she signed into the program with one lesson scheduled each day. Each unit followed the same pattern with six lessons per unit. Each lesson is then divided into five to seven sections. Each section takes a different approach to presenting the material for instance there is video, audio, multiple choice and matching questions, and opportunities for my daughter to record herself speaking French. Each lesson within the unit focuses on different aspect of the French language in relation to the topic. Lesson one introduces the new topic and a common story such as Little Red Riding Hood is shared in French. The entire story is presented and read in French which allows the learner to be fully immersed in the language. Lesson 4 of each unit focuses on a different aspect of culture. Lesson 5 of each unit introduces a new song in French. Lesson 6 is the unit summary which tests the previously learned knowledge of the topic presented. Units 8 and 16 are review units which go over all the previously learned information. How did we use Elementary French I? My daughter used the program by herself because it is written to the student. She signs in several times each week which took her off the automatic schedule that the program creates upon sign in instead she follows her own schedule which is an option. Since this is not a program that we do together, I am not always around to see her work through the assignments, but I am able to see her quiz scores and listen to her recordings if she records them after the fact. Although it is our hopes that she will become fluent in French, I know that for this to be true she will need someone to converse with in French so for now we are using the program to train her ear to understand what she is hearing in French. My daughter enjoys learning French with Middlebury Interactive Languages. It is one subject that she can claim as her own. I appreciate that the program is written in a way that my daughter can work independently. She is able to sign in without my help. She is able to move forward in the lessons with little input from me, and she knows when she doesn’t do as well on an assignment that she can review the previously taught information until she feel comfortable. I am glad that she is able to pursue her interest and learn a language that has always interested her.